The emergence of the Middle East region as a key player in the global plastics industry and the plentiful opportunities it offers to equipment and machinery suppliers and manufacturers were the important factors that attracted a record visitor turnout at the inaugural Plastivision Arabia and ArabiaMold trade fairs. The shows, which were held at Expo Centre Sharjah from May 14 to 17, received 4,763 visitors from 66 countries during their four-day run, leaving a positive impact on the regional plastics and molds industry with their very first edition. The show also had the distinction of seeing almost all the machines displayed getting sold. In order to understand first-hand the exhibitor and visitor response to the launch, Mr Ahmed Mohammed Al Midfa, Chairman, Sharjah Chamber of Commerce and Industry, toured the halls on the last day of the event. He spoke to exhibitors who briefed him on machinery and other equipment on display at their stalls. Being a production powerhouse, exhibitors and visitors believe that the Middle East is the happening place for the plastics industry now. The Middle East, during the last decade, has fast emerged as a serious player in the global market owing to the twin benefits of low raw material and feedstock prices and proximity to the highly lucrative Asian market. A steadily growing population, which now stands at 7.2 million at the end of 2011, is also a significant driver of the economy and supports plastics consumption. “Regional governments and industry bodies are creating a conducive climate for the growth of the plastics industry. A flourishing upstream industry has succeeded in laying a strong foundation for the downstream petrochemical industry, while planned projects will further promote the plastics production in the region,” said Mr Saif Mohammed Al Midfa, Director-General of Expo Centre Sharjah, co-organiser of Plastivision Arabia along with All India Plastics Manufacturers Association (AIPMA). “We were quick to realise the opportunities that the region had in store and in association with AIPMA launched Plastivision Arabia, along with ArabiaMold. Over 150 exhibitors and more than 2,000 pre-registered visitors had already set the pace for a successful show. Now, we have seen an impressive turnout of trade visitors too, providing the icing on the cake,” Mr Midfa added. “India and the UAE are largest trading partners of each other and share a long history of trade and cultural relations. So when we decided to bring the show closer to our customers, we chose the UAE and Expo Centre Sharjah, and the success of the Plastivision Arabia shows that we have been right in our choice. AIPMA is also highly optimistic about the growth prospects of the plastic industry, which were amply demonstrated during the show,” said Mr Jayesh Rambhia, President, AIPMA. Despite being held for the first time, exhibitors said they were happy with the organization and management of the shows and reported receiving good response from the target markets. “The shows were well organized and had enough business opportunities up for grabs. It was a good exhibition for us,” said Akhil Parikh and Harpit Parikh of Rajhans Plastic Pvt Ltd, an exhibitor. The Plastivision and ArabiaMold shows covered an exhibition area of 10,000 square metres and featured exhibitors from 20 countries, displaying raw materials and machinery for key segments such as plastic processing, injection molding, thermoforming, packaging, industrial users, construction, infrastructure, automobile and telecommunication, among others. “I am very pleased with the exhibition on several counts. First, the presence of quality visitors… then, visitor representation from across the region. Above all, good business leads. All these constitute an interesting start for my company to strengthen our presence in the Arab World,” said Najib El Khouri, Senior Sales Manager Middle East, Aschulman. “A very commendable effort for a first edition,” Mr Sunil Jain, President of Rajoo Engineering Limited, New Delhi. “The show has exceeded our expectations. We have been able to show our innovative, value-creating plastic solutions to all visitors and even other exhibitors at Plastivision Arabia 2012,” said Adel Ali Al Fahim, Regional Communications Manager-Middle East, Borouge. 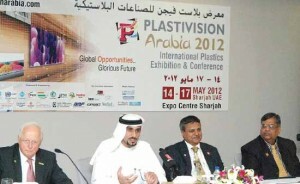 “The market was in need of a show like Plastivision Arabia. We have not only sold our running film-line machine, which was on live display… but also signed contracts for five more of them. We have already booked space for the next edition and will display our complete range of machines,” said B V Shettigar, Gurucharan Industries India. India had a major presence at the show, with nearly half of the exhibitors coming from the country, while the rest came from China, France, Germany, Hong Kong, Iran, Japan, South Korea, Saudi Arabia, Pakistan, Portugal, Qatar, Russia, South Africa, Spain, Switzerland, Taiwan, Turkey, the UAE and the UK. It also featured the Business Opportunity Pavilion, Expert Consultation Counter, Green Pavilion and Recruitment Corner. Plastivision Arabia & ArabiaMold were organized by Expo Centre Sharjah, in association with AIPMA and DEMAT, and the support of the Sharjah Chamber of Commerce and Industry.